﻿ Germany: Awaiting the Divine Performing Arts World Tour! The Divine Performing Arts company 2009 World Tour hopes to surpass its 2008 achievements.The tour celebrates the mysterious splendour of classical Chinese dance and music inspired by the legends, the values and the spirit of traditional Chinese culture. The amazing performances spans the time from 5,000 years ago up to today and ranges from the beauty of nature to the rendition of societal grievances. The show encompasses themes such as virtue, compassion and boldness of heart from China's god-inspired culture, which reaches from Buddhist and Taoist traditions to the cultural treasures of the Tibetan highlands. The artists who reside outside of China present their cultural heritage in a show that is free from the usual Beijing regimentation. Multilingual moderation guides the performances activities, stories and cultural themes. To help the audience understand the meaning of the various songs, a translation of the lyrics is shown on a backdrop. 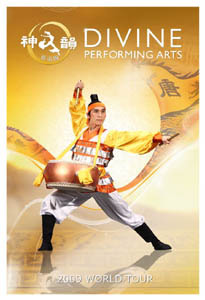 Most of the show presents Chinese classical dance pieces. This dance style was handed down throughout China's 5,000-year history. This breathtaking classical dance system was reworked and perfected by the dancers over many years. The Divine Performing Arts live orchestra that is composed of a variety of Western and Chinese instruments provides a first class listening experience. It plays pieces that are based on Western orchestration and selected styles from Chinese music. "We and the German Falun Gong Association look forward to bringing the Divine Performing Arts company once more to Germany," said Yiyuan Zhou, press spokeswoman for the Chinese language television broadcaster NTDTV (New Tang Dynasty Television) in Germany. Despite pressure by representatives of the Chinese Communist regime, Yiyuan Zhou exuded, as she did the year before, great confidence: "We heard many enthusiastic and supportive voices from our audiences after the 2008 performances. We are expecting even greater positive responses for the coming performances, because the audience has become more and more aware of China, especially through the Beijing Olympic Games." Performances in Frankfurt: Saturday 2/21/09 at 7:30 p.m. and Sunday 2/22/09 at 3 p.m. in the Jahrhunderhalle (Century Hall) on the Pfaffenwiese. Online tickets are available at www.ticketonline.de and from ticket agencies. Price: €29.00 to €69.00 VIP Seats: €120.00. Tickets purchases before Christmas 2008 are available at a 10% discount. Groups of more than 20 persons will receive a 15% discount and groups over 50 people will receive a 20% discount. A VIP ticket is for the best seats at the Jahrhunderthalle and the holders of such tickets will be greeted with champagne before the show. Also, such ticket holders can meet with the artists for food and celebrations after the show. The German Falun Gong Association. Divine Performing Arts Show: "We Learned What Happiness Is"